With little time left to “bend the curve” on MDG4 achievement, we must seize child survival opportunities where we find them. The UN Special Envoy’s Office, with the participation of key partners, has published five MDG4 acceleration roadmaps built on the principle of optimizing existing health delivery systems to distribute the child survival interventions that target the leading causes of death. Despite a halving of child deaths since 1990 and taking into account the impact of the child survival investments in the pipeline, the current rate of decline in child mortality will still not be fast enough to achieve MDG4. Estimates suggest that in 2015 one million child deaths will still need to be prevented to achieve MDG4. To make this happen, we must collaborate more closely than ever before. Achieving the health MDGS will require using these existing delivery pathways to distribute the child survival interventions that target the leading causes of death. These include pneumococcal and rotavirus vaccines, treatments for pneumonia and diarrhea, nutritional supplements and healthy behavior promotion – particularly breastfeeding. Failing to fully utilize existing outreach platforms to deliver the interventions with the greatest lifesaving potential represents perhaps the single biggest “missed opportunity” which will be measured in children’s lives lost and MDG gains forfeited. It would be irresponsible to continue business as usual, and not further bring down the walls hindering progress between the different communities. The promising collaboration underway between those working on malaria, pneumonia and diarrheal disease joining together to care for the sick child – through what is known as “integrated Community Case Management” with community health workers – is an excellent example of what might be possible when the walls come down. While each additional intervention for inclusion in these delivery platforms will need to be considered by national authorities within their local contexts, we encourage global partners and donors to fully support these local efforts to achieve the greater coordination and flexibility that will be necessary to fully realize the additional lives saved and close the MDG4 achievement gap, and lay the foundation for further reductions as we seek to put an end to all preventable child deaths. With little time left to “bend the curve” on MDG achievement, we must seize opportunities where we find them. A movement led by the UN Secretary-General to mobilize and intensify global action to improve the health of women and children around the world. 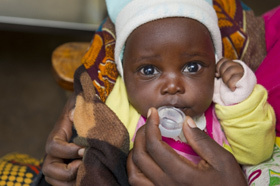 A global effort to reinvigorate the MDG commitment to end preventable child deaths.